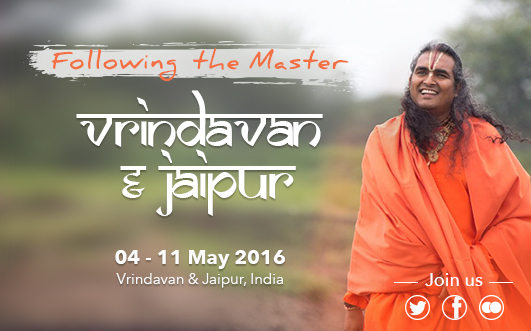 We are excited to cover the next “Following the Master” series from Jaipur and Vrindavan. It’s our hope that you will join us on this journey over the next week as we write about the cities, the temples, and most importantly, the experiences of traveling in India with Sri Swami Vishwananda. The pilgrimage to Jaipur and Vrindavan started on April 30th with the first ever Atma Kriya Yoga retreat in India. It was an exciting and intense past few days as the retreat concluded on May 3rd, in Vrindavan with the pilgrimage participants preparing to set off on the next part of the journey to Jaipur. Below you can find an overview of what the participants did over the past few days. The Atma Kriya Yoga techniques given by Sri Swami Vishwananda is one of the most powerful yoga practices ever given to mankind. For the participants to have the opportunity to awaken Love through the practice of AKY in the holy places sanctified by Lord Krishna, is a truly unique opportunity. 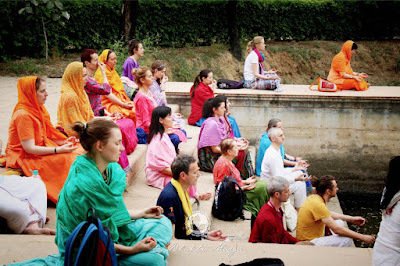 Atma Kriya Yoga and Vrindavan. Love and love. 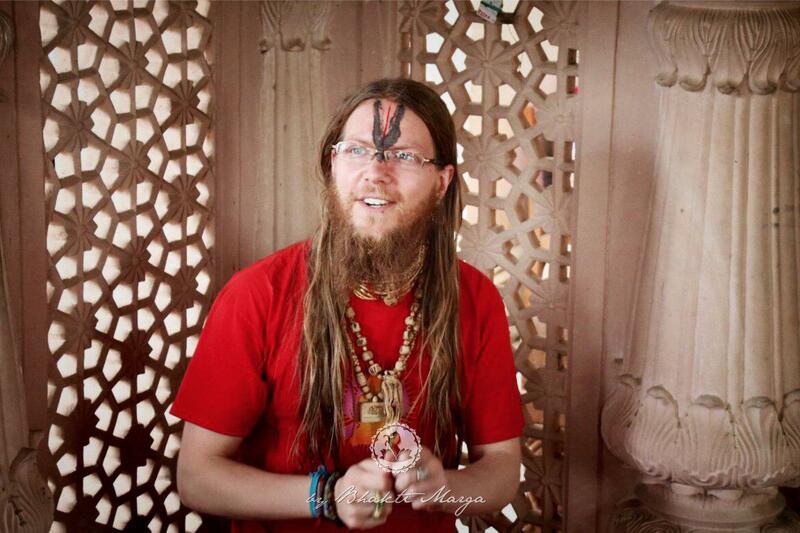 And what is Guruji? Love. 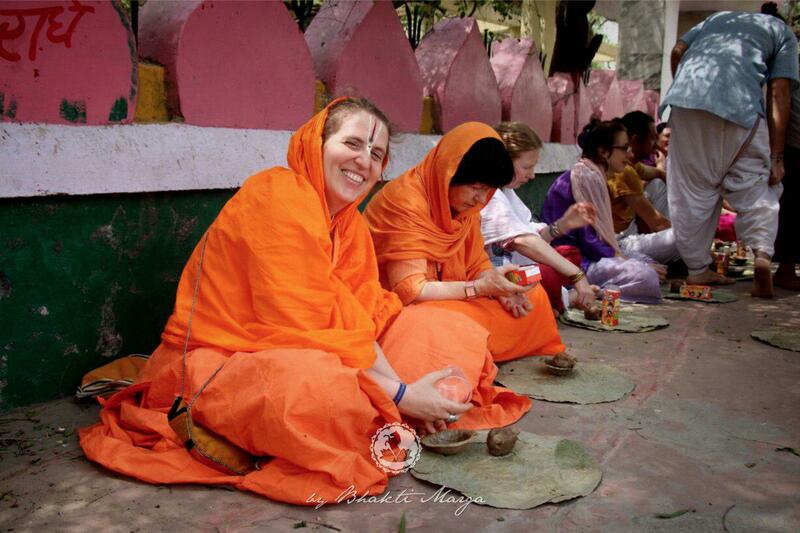 Which path does Guruji show to us? Just Love. We have had an amazing AKY Retreat these three days. 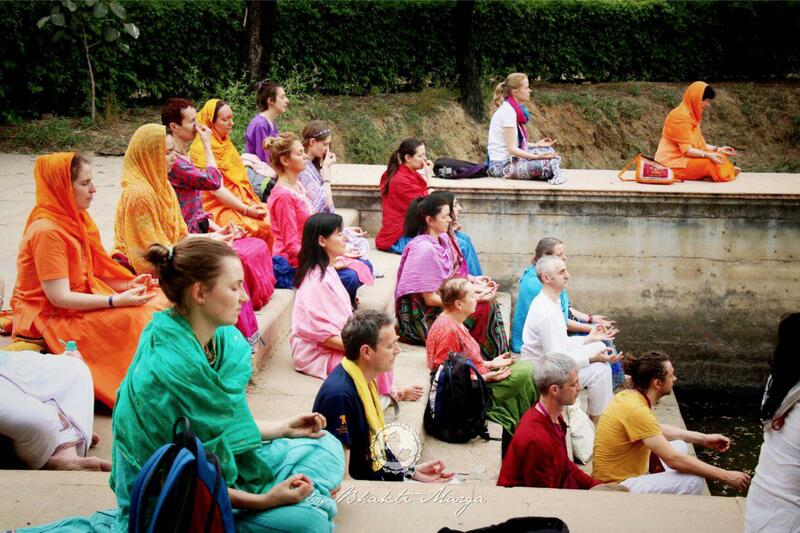 As Guruji says, Atma Kriya Yoga means to be aware of God in all your actions in your life. 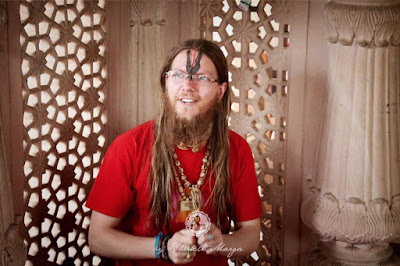 And Vrindavan is a unique place to help to do that connection, to help the sadhaks to begin to feel AKY in their daily lives, not only as techniques, but as a way of life. Guruji always reminds us of the importance of the sangha, the importance of being together to pray, to sing, to do AKY… The importance of being candles of light for others, of sharing what he gives to us. 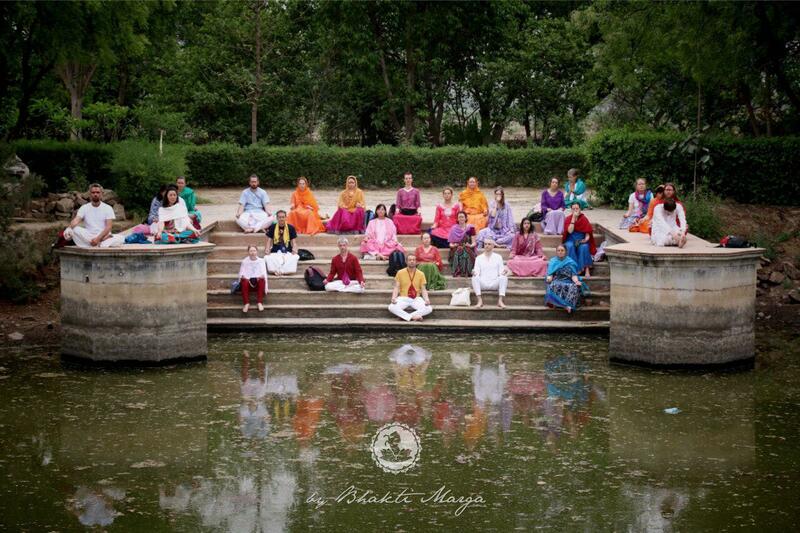 These retreats are part of this, and a special moment to help the participants to become more aware of the precious gift that we have with Atma Kriya Yoga. And if Atma Kriya Yoga is the nine forms of bhakti, there’s no better place than the heart of love and devotion to infuse that in the lucky sadhaks. 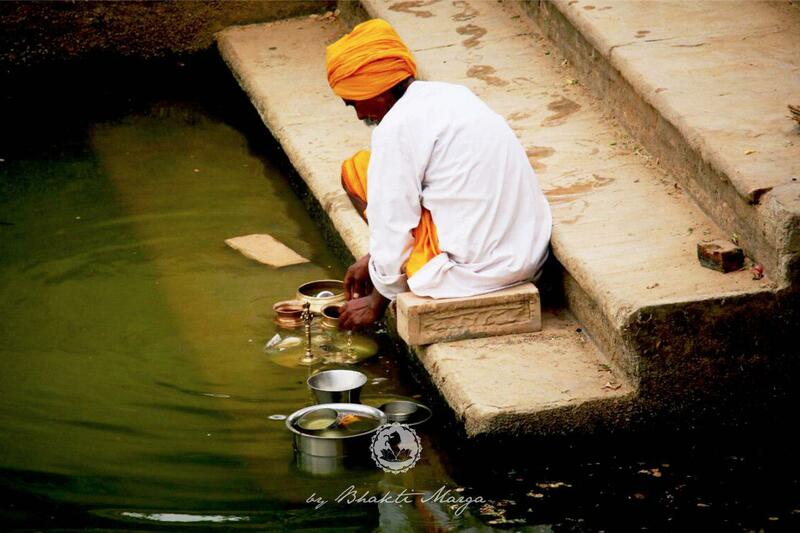 There aren’t enough words to describe what one can feel when arriving at Brindavan. One things for sure, it makes a big difference in your heart! These three days of Atma Kriya Yoga retreat enlightened us in such a way that it will be remembered and felt in our hearts for aeons. Just to pinpoint some of the highlights, we were fortunate enough to walk where Krishna walked, meditate and do our kriya where Radha danced, pay our respects to Banke Bihari and Madan Mohan, feel our bare feet in sacred soil. Reading about these stories in books like “Inspirations” is one thing, but living it where they really happened is no less than magic. 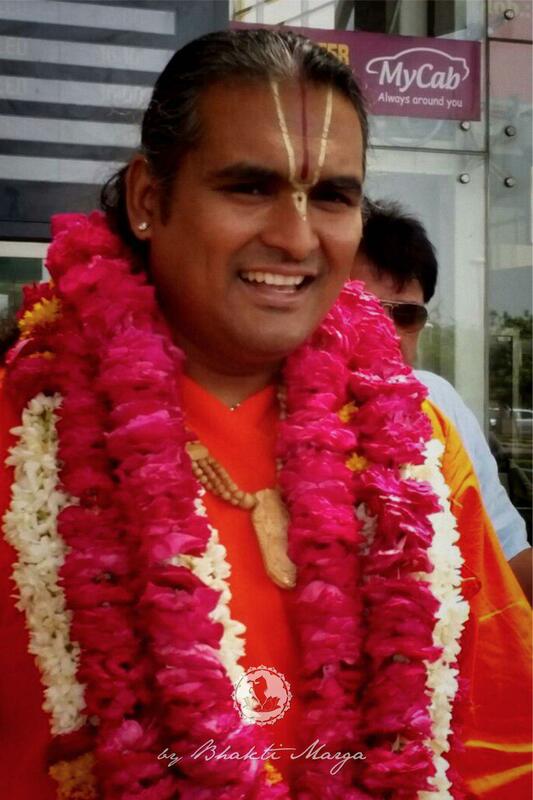 After concluding an amazing past few days of going deeper into Atma Kriya Yoga, we set off on a new journey as we travel to the Holy city of Jaipur, India to begin the second phase of the pilgrimage with Sri Swami Vishwananda. Stay tuned!